What Is the Membrane and Why Remove It? 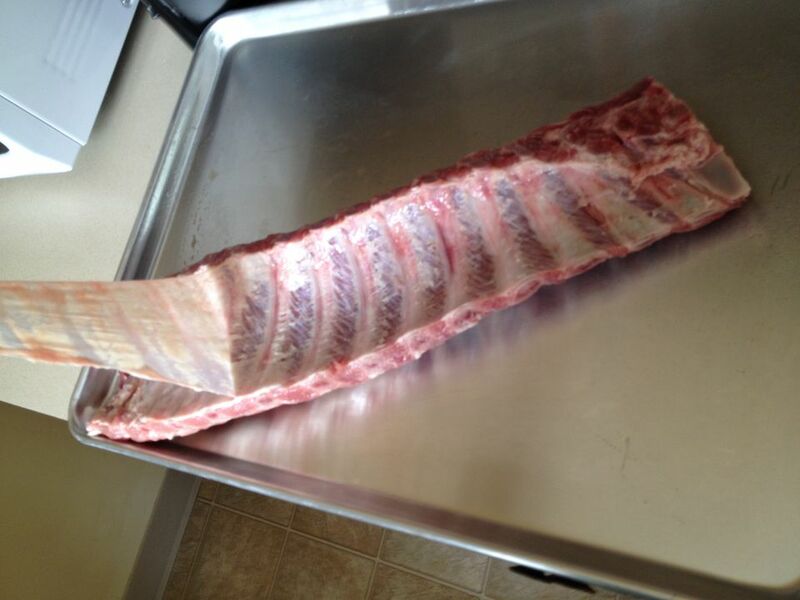 Pork ribs have a membrane on the back that needs to be removed before you cook the ribs. If you don't remove the membrane, your ribs won't be as flavorful and the membrane will be tough to chew. The membrane (called the peritoneum) is a piece of tissue that is attached to the underside of the ribs. Unlike the cartilage and other connective tissue between and around the ribs, this membrane does not soften when it's cooked. It just comes out tough and chewy, like a sheet of plastic. It also forms a barrier against your seasonings (like a dry rub), preventing those flavors from penetrating the meat. If you are cooking on a grill or smoker, the membrane will prevent the smoke flavors from fully penetrating the meat. The peritoneum is thicker near the backbone, so it's more important to remove it from back ribs, which come from high up on the back, than spare ribs, which come from the belly area. On any cut, it's really easy to remove and takes about five seconds. Now that you know about it, there's really no reason to leave it on. Once you know what to look for and how to do it, removing the membrane is very easy. The first step is to just pull up a corner of the membrane at one edge of the slab of ribs. It'll look like a sort of floppy white piece of tissue. You can slide the point of a blunt knife (such as a table knife) underneath to get it started, but you can generally just pull it up with your fingers. Once it's up, just peel it away from the ribs. You can use a paper towel to help you grip onto the membrane since it can be a little bit slippery. If that's not the case, just keep a firm grip on it with your hands. Continue to pull it and it should come off the ribs in one whole piece. Once the membrane is removed, you'll see how elastic the peritoneum is. That is exactly why it's best to remove it. When the membrane remains on the ribs, it's like chewing on a big rubber band. Once it's peeled off, discard it and continue seasoning and prepping your ribs. There are so many tasty ways to prepare ribs and the methods of cooking them are quite versatile. From a great recipe for baby back ribs you can make in a slow cooker to another one for Memphis-style spare ribs you can cook on the grill, you'll find your favorite in no time. If cooking ribs is new to you, it's best to start with a beginner's guide to pork ribs and you can also follow tips and tricks for cooking ribs on the grill for some helpful advice. Is a Forged Knife Better Than a Stamped One? What Are the 7 Basic Parts of a Chef's Knife? What Is a Culinary Knife Bolster?